We are in the final month of the year already, ladies! What better way to close out the year than with rejoicing and celebrating the birth of the newborn King. With the busyness of all that December brings, let us take a few moments each day to be still and reflect on what is really means to wait in anticipation. The word “Advent” means “coming.” People celebrate Advent in different ways, but the reason is the same. Advent is about anticipation and waiting for the coming of something. Advent is about the coming of the One who would change everything. We wait for the One who came as a tiny baby in a manger, but who is also our our Redeemer, our Messiah, our King. 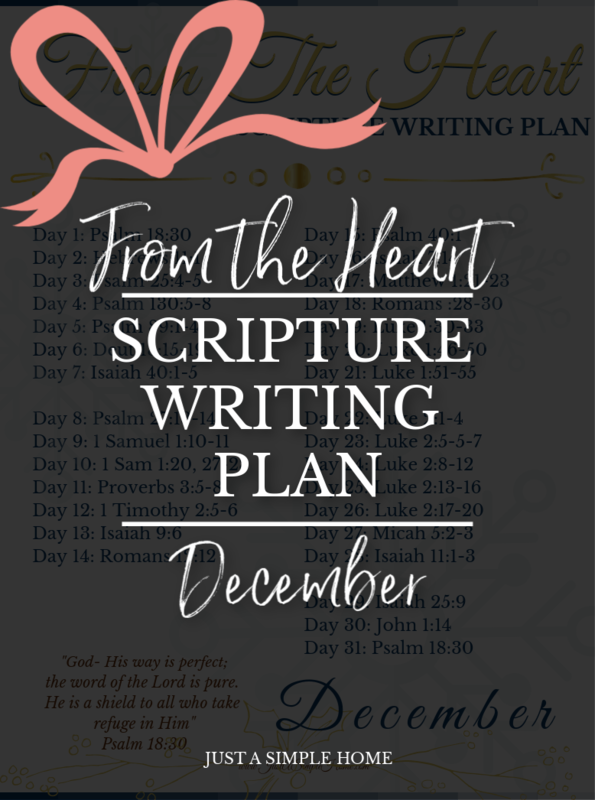 Join us in a Scripture writing plan for the month of December and copy down God’s Word. During the month of December, we will be reading and writing about the hopeful anticipation involved in a season of waiting. Throughout the Bible, we are pointed to the Messiah who would change everything. The world waited in anticipation for generations for the coming Savior. In celebrating Advent, we get a small glimpse into what it must have felt like to wait and yearn for so long. I am sure they did not understand why He hadn’t come yet, or why their season of waiting was so long. They experienced years of what they thought was silence. I know how frustrated and weary I can become in seasons of my own waiting. Can you imagine how generations must have felt? But God – He will do what He said He will do, and in our waiting He will be our shield and refuge. Advent reminds us that waiting is not always a bad thing. Life in waiting is surrendering to our Lord, and trusting our Immanuel. ~ How does Advent encourage us to trust the Lord? ~ How can you live life expectantly? ~ When have you struggled with waiting before? ~ What distractions do you have this season that will pull you away from the Lord? ~ What are you looking forward to this Advent season? During Advent, we anticipate the coming of Jesus, then we celebrate His coming, and then we wait for Him to come again. Hopeful expectation, joyful anticipation. We wait for Him. Each of the Scriptures should take no more than ten to fifteen minutes a day to copy. Join me in spending fifteen minutes a day listening to God’s Word as He shows us what it means to wait in anticipation for the One who would change everything. If you have the FROM THE HEART PRAYER JOURNAL, that is a perfect place to copy down these Scriptures. If not, just grab a any journal or pretty notebook will do. If you would like to do this in a small community, JOIN US HERE! Comment in the monthly thread on Facebook or on Instagram so we can join together and hear God speak through us. This is a great idea and very timely. Terryn, I really love the reflection questions. They would be great even for family discussion or journaling time. 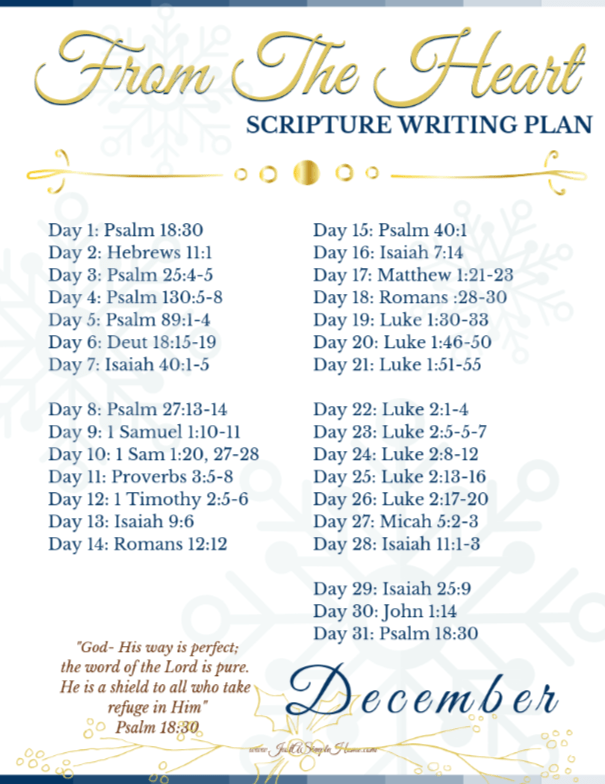 My goal was to write Scripture every day this year (didn’t quite…) but I am saving this to try this month! Thanks! I liked you advent questions. This is a good start for me. Really like the writing part. So thank you for helping me in this area. 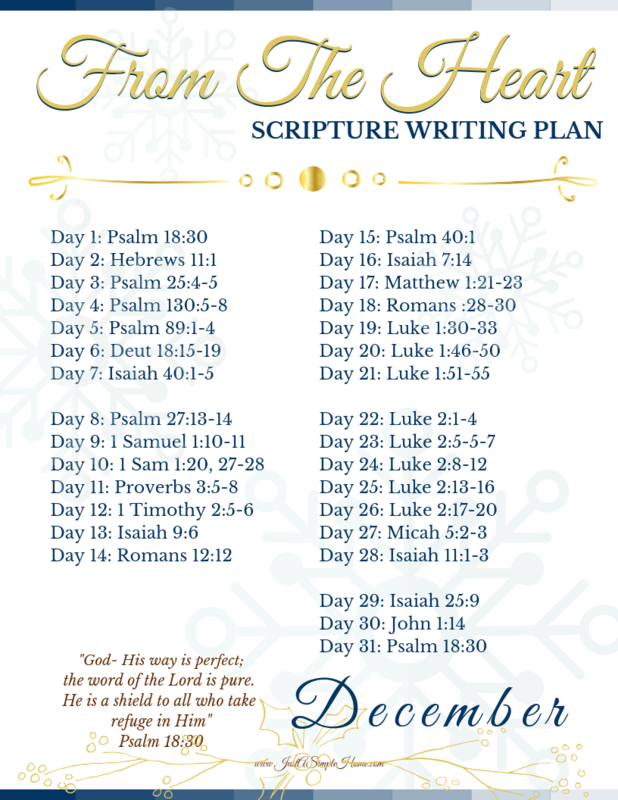 Oh I love Scripture writing plans. I used to write Scripture every single day, but then I got out of the habit. This is the kick in the back side that I really needed to get back into it. I so deeply enjoy writing the Scriptures, but I just let life get in the way. Thank you so much for posting this. You really have encouraged me to get back to the habit. I’m so excited about this! I need to get back in the habit of journaling while I study my scriptures. Thank you for putting this together!